Yesterday I looked at the extremely low reading the Quantifiable Edges Nasdaq Volume Spyx indicator put in during the week of April17th. After posting a reading below 0 did it again the week of the 24th. 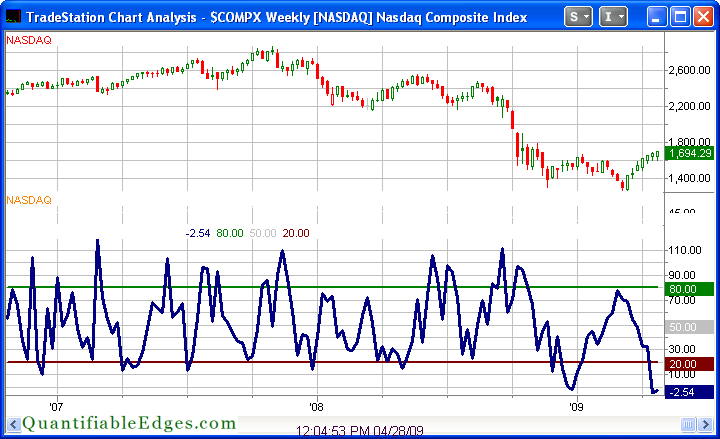 Below is an updated weekly chart of the Nasdaq Spyx ending on the 24th. Going back to 2000 (as far as Nasdaq Spyx data has been calculated) there has only been one other time the market had back to back readings below 0. That was the week ending 11/29/02, which came 7 weeks after the October 2002 bottom. It marked the top of that rally. From there it pulled back for over 3 months before the March 2003 rally and new bull market began. Similarly, we are now about 7 weeks off of the March bottom. Another instance that came close to a back to back sub-zero reading was December of 2008. What followed that was obviously quite bearish over the next few months. There have only been 4 instances where the Nasdaq Spyx has posted a sub-zero weekly reading and then the Nasdaq has risen the next week. Those four instances along with their 8-week returns are listed below. The “best” result above was the 12/04 – 1/05 period where the Nasdaq “only” lost 5%. Sample sizes for these tests and yesterday’s are too small to read much into. It would be dangerous to draw conclusions from so few instances. Still, with such lopsided intermediate-term results its worth taking note. While the week is only 2 days old, the indicator has yet to rise as of Tuesday’s close. Volume indicators aren’t the only ones reaching extremes. I noted last week breadth was more overdone by at least one measure than it’s been in decades. While price hasn’t yet begun to roll over the rate of ascension has certainly been slowed. The S&P hasn’t hit a new high in 7 trading days. This is the 1st consolidation of more than 4 days since the March lows. Are we setting up for a pullback or consolidation of several weeks? I don’t know. I am seeing some warning signs that would suggest caution. I’ll be keeping my eye out for more of them, as well. Sobering and alarming. But within what time frame will this running out of steam take place? If we resume uptrend, say, for a while, then peak two weeks from now-- at how much higher a level will the following (nominal) 6-week decline.. to a LOWER point than today.. be taking place from? And how close to that coming inflection-point would one dare risk their current bullish buy/hold continuation-signal positions? To me this seems like a converse of the upside Breadth Thrust Warning-- except to the downside. Not precise, day to day. But very emphatic. Today was a 'Fed day'. It's total non-eventness spoke volumes about the restoration of normalcy, and lent a strong intraday bullish spin. Some key datapoints went into 2009 breakout zones today. We still have one of the most FAVORABLE seasonal periods (very late April thru Week 1 May) immediately ahead. Also, there is the upcoming monthly Performance Snapshot of tracked investments, in a strongly UP month-- which always engenders a bit of posturing and jockeying by the Institutional behemoths, as they pad and adjust for the camera. Though such quickly reverses, it can add impetus to short term trends already set in motion. There is often a local HI around the Cinco De Mayo, a holiday I celebrate. I often “sell in May and go away” on THAT day, and go get drunk. Given how many momentum indicators are looking STRONG, macho, rather than badly “overbought”-- is all of the above cause for near-term“Bear beware?” At least for a goodly spell..? They take a long position in a stock, and then seeing it fall in value, attempt to lower their average cost by purchasing more of it, only to find that it drops even further in value, quite often never to recover to even the lower cost paid. The Most Overbought Market At Least 23 Years? Is SPX Down Big & VXO Down Bearish?